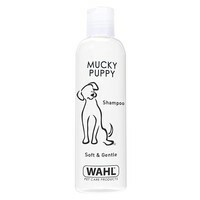 Wahl Mucky Puppy Shampoo has been carefully formulated as a ready-to-use shampoo that is gentle enough for the sensitive skin and coat of young animals. Based on natural ingredients including Aloe Vera for extra sensitive skin, Wahl Mucky Puppy has a mild cleansing action that will gently remove grease and dirt from the coat, leaving it clean and easy to brush. Wahl Mucky Puppy Shampoo is already diluted and is suitable for use on all animal hair types, including kittens.